Liberate yourself from the kitchen. Become a guerrilla chef. The fine art of guerrilla cooking. Why eat last night’s leftovers when you can cook a frittata at the comfort of your own desk? My daily homework in third grade was to write down a word and its definition from the dictionary. One day, the kid next to me forgot to do the assignment. As the teacher passed through the aisles, sharing our polysyllabic selections aloud, my seatmate borrowed my dictionary and scribbled something down. “Cook: to prepare with heat,” the teacher read from his journal. I can’t recall any other vocabulary words we learned that school year, but I remember this incident in detail—the paperback dictionary, the name and face of the classmate who moved away that summer, and the disapproving glare the teacher gave him. I remember wondering why dictionary makers would include a word like cook. Everyone knows what it means. Why waste the paper? That four-word definition has stayed with me for 25 years, though, because there’s value in recognizing the essence of what can become a complicated act. Cooking equals food plus heat. Nothing about food miles or amino acids. No mention of high-carbon knives or a panini press. Most importantly, nothing about a kitchen. Kitchens are, admittedly, handy places to cook, in the same way that beds are great places for sleeping. But, just as you can sleep wherever you happen to be tired, you can cook anywhere so long as you have the essentials (food, heat). At any given time and place, I’m ready to whip up a stir-fry, a rice pilaf, or a couple of tacos. I call it guerrilla cooking. It all started at work. Office kitchens—if it’s fair to call them that—are right up there with morgues and faux Irish pubs as the most depressing places to be at noon on a weekday. They’re usually windowless, filthy, and reeking of stale, microwaved cheese. They also have a feeling of class segregation, since the administrative staff tends to use them more often, while their executive overlords lunch out on the company dime. And who can blame the bosses? Nothing worth eating has ever come out of an office kitchen. It’s either frozen dinners or last night’s leftovers, entombed in a plastic container and revivified in the microwave. If you’re lucky, you might get a day-old homemade cookie that some office drone’s family refused to eat. At my office, it wasn’t convenient to pop out and buy something, so I had to improvise. At first all I used was a cheap frying pan and an ordinary hot plate plugged into the outlet beneath my desk. (Don’t worry, it takes a lot to trip an office circuit breaker.) I also experimented with an electric fondue pot, which served as heat source and cookware in one. Cooking in my office was probably against company policy—if the idea had ever occurred to the automatons in human resources—but no one ever noticed. I’d shut the door and let my office fill with the aroma of sautéed garlic and chopped cilantro. As for the food itself, you’ll need a box of kitchen essentials in small containers. Olive oil, salt and pepper, and bouillon cubes are extremely useful, but build your personal stash with additional herbs and spices to suit your needs. Keep it in your desk drawer and refill from home as needed, or adapt a toiletry case to the purpose and carry it to and from work everyday. The key to guerrilla cooking is preparation. I recommend doing all of your knife work at home. A couscous pilaf is a great dish for beginners, because it requires no heat control. At home, dice onions, carrots, celery, and cauliflower in some combination to make two cups of vegetables, and put them in a zip-top bag. Store one cup of couscous and a tablespoon of paprika in a separate bag. In a third bag, put three-quarters of a cup of toasted and chopped almonds, walnuts, or cashews. The on-site preparation is easy. Sauté the vegetables. Add the couscous and paprika and cook for a minute or so, stirring. Add one-and-a-half cups of water, plus salt and one of your handy bouillon cubes, and bring to a boil. Cover, remove the pan from the heat, and let it sit for five minutes. Mix in the nuts. Voila. 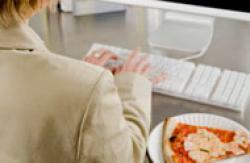 A fresh lunch in the privacy of your own office. You can take it from here. Stir-fries, soups, frittatas, and quesadillas are obvious choices, but be creative. This is all about breaking rules. You don’t need an oven to make bread, cookies, or pizzas, if you get good at controlling the delivery of heat from stove to food. Scour the Internet for intriguing recipes, and adapt them to your minimalist set-up. Or look to camping cookbooks, and then adorn them with luxuries like white wine or fresh cheeses that you couldn’t take on a backpacking trip. Once your culinary skills are off the leash, you can take your portable kitchen anywhere. Get a commercial camping stove and start cooking your lunch in the park across the street, or on the rooftop deck. If cost is an issue you can go totally rogue and jury-rig an alcohol burner from scratch. There are plenty of templates out there, but the most basic version consists of a tuna fish can filled with perlite rocks and denatured alcohol, then covered with an aluminum screen. (All those items are available for purchase at any hardware store.) Keep in mind that these burners produce an open flame, so you’ll need to be prepared for mishaps. If you’re cooking indoors, open a window for ventilation or get a carbon monoxide monitor. All this may sound like a hassle, but it’s not. My entire alcohol stove set up fits inside a lightweight pot and weighs less than 6 ounces. And don’t worry about judgmental co-workers. They just don’t understand what cooking is all about. Food plus heat; it’s that simple.